Another quarter, another record-breaking Tesla loss: Let's take a question from YouTube, eh, Mr Musk? Tesla CEO Elon Musk flamed Wall St analysts last night that dared to question his firm's finances, after his leccy car biz reported another set of record quarterly losses, burning through more of the cash pile. 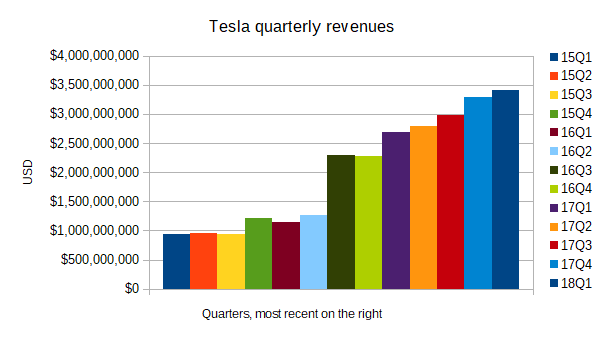 For Q1 ended 31 March, Tesla's revenues came in at $3.41bn, an increase of 26 per cent percent year-on-year. Sales of cars jumped to $2.56bn versus $2.03bn but car leasing crashed 46 per cent to $173.4m. 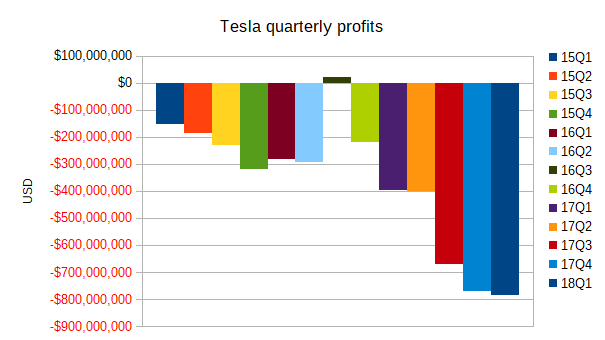 Across the board Tesla's costs were up, with the total cost of revenues being reported in its latest quarterly financial filing as $2.9bn, of which automotive sales accounted for $2bn alone. A year ago those costs were $2bn, of which $1.4bn were car sales. Tesla stock is down 5.20% to $285.50 apiece in after-hours trading. Musk is gonna Musk, but it's not such a great way to deal with self-driving car concerns. Net losses more than doubled to $709.5m versus the $330.18m in Q1 '17. The modest increase in R&D spending, up from last year’s $322m to $367m, didn't help. The company currently has around $2.67bn of cash and "cash equivalents" in the bank, a decline from the $3.34bn in its ledgers at the same point last year. Musk himself earned a market rebuke of a 5 per cent share price dip, as reported by Reuters, by cutting off a financial analyst mid-question as the man started asking about capital requirements of the business: "Excuse me, excuse me. Next, next. Boring bonehead questions are not cool. Next." He also flamed another analyst that asked about Model 3 reservations. "We're going to go to YouTube. Sorry, these questions are so dry. They're killing me." Reuters added that His Muskiness needs to "reverse what today amounts to a $22,584 pre-tax loss per vehicle built," something he isn’t going to achieve by taking questions from YouTubers instead of financial folk. Tesla is stopping production temporarily while it sorts out its production lines, including an automated line being set up in Germany. Its strategy is to install robots in place of human assembly line workers, in the hope that the medium and long-term cost savings will outweigh the traditional wage bill. "After achieving a production rate of 5,000 per week, we will begin offering new options such as all-wheel-drive and the base model with a standard-sized battery pack," promised Musk.